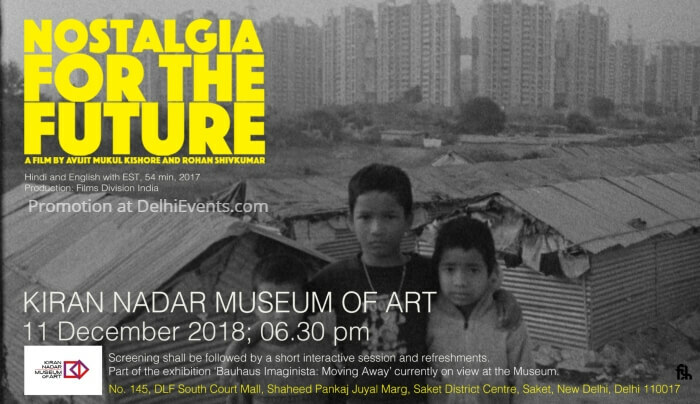 Event Description : Kiran Nadar Museum of Art invites you to the screening of "Nostalgia for the Future" film by Avijit Mukul Kishore and Rohan Shivkumar. ‘Nostalgia for the Future’ is a film on Indian modernity, the making of the citizen and the architecture of the home. It looks at four distinct imaginations of homes and bodies across examples of buildings made over the period of a century. The film explores these spaces and the bodies that were imagined to inhabit them through the evocation of the cinematic and aural collective memory of a nation reinventing itself. The film is produced by Films Division India, the documentary film producing organisation of the Government of India. The film won the Best documentary prize at the International Documentary and Short Film Festival of Kerala, Trivandrum, India, June 2017 and Jury’s Special Mention at Signs Festival, Kochi, India, 2017. ‘Bauhaus Imaginista: Moving Away’ currently on view at the Museum. Screening shall be followed by a short interactive session with the filmmakers.